How would you rank the popularity of a programming language? People often discuss which languages are the best, or which are on the rise, but how do we actually measure that? One way to do so is to count the number of projects using each language, and rank those with the most projects as being the most popular. Another might be to measure the size of a language’s “community,” and use that as a proxy for its popularity. Each has their advantages and disadvantages. Counting the number of projects is perhaps the “purest” measure of a language’s popularity, but it may overweight languages based on their legacy or use in production systems. Likewise, measuring community size can provide insight into the breadth of applications for a language, but it can be difficult to distinguish among language with a vocal minority versus those that are actually have large communities. Solution: measure both, and compare. This week John Myles White and I set out to gather data that measured both the number of projects using various languages, as well as their community sizes. While neither metric has a straightforward means of collection, we decided to exploit data on Github and StackOverflow to measure each respectively. 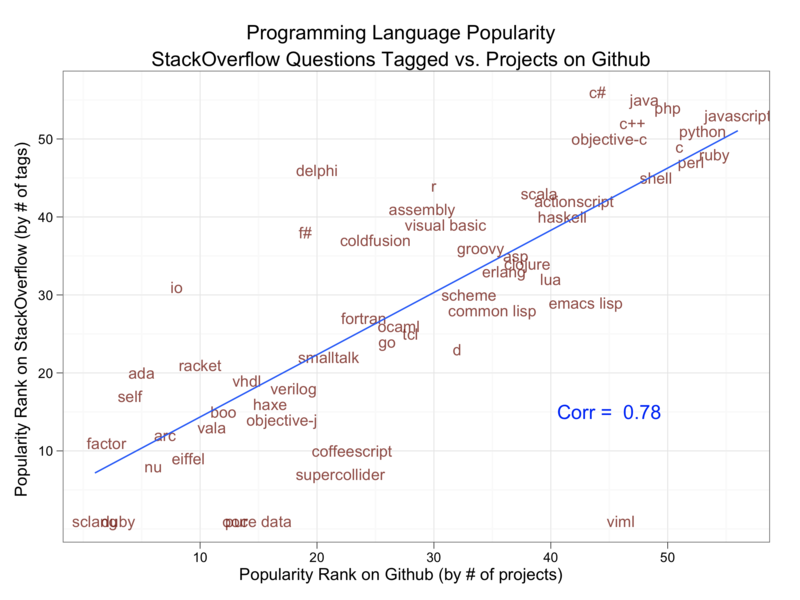 Github provides a popularity ranking for each language based on the number of projects, and using the below R function we were able to collect the number of questions tagged for each language on StackOverflow. Metrics are highly correlated: perhaps unsurprisingly, we find that these ranks have a correlation of almost 0.8. Much less clear, however, is whether extensive use leads to large communities, or vice-a-versa? Popularity is tiered: for those languages that conform to the linear fit, there appears to be clear separation among tiers of popularity. From “super-popular” cluster in the upper-right, to the more specialized languages in the second tier, and then those niche and deprecated languages in the lower-left. What’s up with VimL and Delphi? : The presence of severe outliers may be an indication of weakness in these measures, but they are interesting to consider nonetheless. How is it popular that VimL could be the 10th most popular language on Github, but have almost no questions on StackOverflow? Is the StackOverflow measure actually picking up the opaqueness of languages rather than the size of their community? That might explain the position of R.
We Dataists have a much more shallow language toolkit than is represented in this graph. Having worked with my co-authors a few times, I know we primarily stick to the shell, Python, R stack; and to a lesser extent C, Perl and Ruby, so it is difficult to provide insight as to the position of many of these languages. If you see your favorite language and have a comment, please let us know. Raw ranking data available here. Yesterday the good folks at IA Ventures asked me to lead off the discussion of data visualization at their Big Data Conference. I was rather misplaced among the high-profile venture capitalists and technologist in the room, but I welcome any opportunity to wax philosophically about the power and danger of conveying information visually. The emphasis is added to highlight the goal of all data visualization; to present an audience with simple small truth about whatever the data are measuring. To explore these ideas further, I provided a few examples. As the Afghanistan war slide illustrates, networks are often the most poorly visualized data. This is frequently because those visualizing network data think it is a good idea to include all nodes and edges in the visualization. This, however, is not making a complex thing simple—rather—this is making a complex thing ugly. Below is an example of exactly this problem. On the left is a relatively small network (V: ~2,220 and E:~4,400) with weighted edges. I have used edge thickness to illustrate weights, and used a basic force-directed algorithm in Gephi to position the nodes. This is a network hairball, and while it is possible to observe some structural properties in this example, many more subtle aspects of the data are lost in the mess. On the right are the same data, but I have used information contained in the data to simplify the visualization. First, I performed a k-core analysis to remove all pendants and pendant chains in the data; an extremely useful technique I have mentioned several times before. Next, I used the weighted in-degree of each node as a color scale for the edges, i.e., the dark the blue the higher the in-degree of the node the edges connect to. Then, I simply dropped the nodes from the visualization entirely. Finally, I added a threshold weight for the edges so that any edges below the threshold are drawn with the lightest blue scale. Using these simple techniques the community structures are much more apparent; and more importantly, the means by which those communities are related are easily identified (note the single central node connecting nearly all communities). To discuss the importance of extracting small information from large data I used the visualization of the WikiLeaks Afghanistan War Diaries that I worked on this past summer. The original visualization is on the left, and while many people found it useful, its primary weakness is the inability to distinguish among the various attack types represented on the map. It is clear that activity gradually increased in specific areas over time; however, it is entirely unclear what activity was driving that evolution. A better approach is to focus on one attack type and attempt glean information from that single dimension. On the right I have extracted only the ‘Explosive Hazard’ data from the full set and visualized as before. Now, it is easy to see that the technology of IEDs were a primary force in the war, and as has been observed before, the main highway in Afghanistan significantly restricted the operations of forces. Finally, to show the danger of data deception I replicated a chart published at the Monkey Cage a few months ago on the sagging job market for political science professors. On the left is my version of the original chart published at the Monkey Cage. At first glance, the decline in available assistant professorships over time is quite alarming. The steep slope conveys a message of general collapse in the job market. This, however, is not representative of the truth. Note that in the visualization on the left the y-axis scales go from 450 to 700, which happen to be the limits of the y-axis data. Many data visualization tools, including ggplot2 which is used here, will scale their axes by the data limits by default. Often this is desirable; hence the default behavior, but in this case it is conveying a dishonest perspective on the job market decline. As you can see from the visualization on the right, by scaling the y-axis from zero the decline is much less dramatic, though still relatively troubling for those of us who will be going on the job market in the not distant future. These ideas are very straightforward, which is why I think they are so important to consider when doing your own visualizations. Thanks again to IA Ventures for providing me a small soap box in front of such a formidable crowd yesterday. As always, I welcome any comments or criticisms. Last Monday I—humbly—joined a group of NYC’s most sophisticated thinkers on all things data for a half-day unconference to help O’Reily organize their upcoming Strata conference. The break out sessions were fantastic, and the number of people in each allowed for outstanding, expert driven, discussions. One of the best sessions I attended focused on issues related to teaching data science, which inevitably led to a discussion on the skills needed to be a fully competent data scientist. As I have said before, I think the term “data science” is a bit of a misnomer, but I was very hopeful after this discussion; mostly because of the utter lack of agreement on what a curriculum on this subject would look like. The difficulty in defining these skills is that the split between substance and methodology is ambiguous, and as such it is unclear how to distinguish among hackers, statisticians, subject matter experts, their overlaps and where data science fits. What is clear, however, is that one needs to learn a lot as they aspire to become a fully competent data scientist. Unfortunately, simply enumerating texts and tutorials does not untangle the knots. Therefore, in an effort to simplify the discussion, and add my own thoughts to what is already a crowded market of ideas, I present the Data Science Venn Diagram. On Monday we spent a lot of time talking about “where” a course on data science might exist at a university. The conversation was largely rhetorical, as everyone was well aware of the inherent interdisciplinary nature of the these skills; but then, why have I highlighted these three? First, none is discipline specific, but more importantly, each of these skills are on their own very valuable, but when combined with only one other are at best simply not data science, or at worst downright dangerous. For better or worse, data is a commodity traded electronically; therefore, in order to be in this market you need to speak hacker. This, however, does not require a background in computer science—in fact—many of the most impressive hackers I have met never took a single CS course. Being able to manipulate text files at the command-line, understanding vectorized operations, thinking algorithmically; these are the hacking skills that make for a successful data hacker. Once you have acquired and cleaned the data, the next step is to actually extract insight from it. In order to do this, you need to apply appropriate math and statistics methods, which requires at least a baseline familiarity with these tools. This is not to say that a PhD in statistics in required to be a competent data scientist, but it does require knowing what an ordinary least squares regression is and how to interpret it. In the third critical piece—substance—is where my thoughts on data science diverge from most of what has already been written on the topic. To me, data plus math and statistics only gets you machine learning, which is great if that is what you are interested in, but not if you are doing data science. Science is about discovery and building knowledge, which requires some motivating questions about the world and hypotheses that can be brought to data and tested with statistical methods. On the flip-side, substantive expertise plus math and statistics knowledge is where most traditional researcher falls. Doctoral level researchers spend most of their time acquiring expertise in these areas, but very little time learning about technology. Part of this is the culture of academia, which does not reward researchers for understanding technology. That said, I have met many young academics and graduate students that are eager to bucking that tradition. Finally, a word on the hacking skills plus substantive expertise danger zone. This is where I place people who, “know enough to be dangerous,” and is the most problematic area of the diagram. In this area people who are perfectly capable of extracting and structuring data, likely related to a field they know quite a bit about, and probably even know enough R to run a linear regression and report the coefficients; but they lack any understanding of what those coefficients mean. It is from this part of the diagram that the phrase “lies, damned lies, and statistics” emanates, because either through ignorance or malice this overlap of skills gives people the ability to create what appears to be a legitimate analysis without any understanding of how they got there or what they have created. Fortunately, it requires near willful ignorance to acquire hacking skills and substantive expertise without also learning some math and statistics along the way. As such, the danger zone is sparsely populated, however, it does not take many to produce a lot of damage. I hope this brief illustration has provided some clarity into what data science is and what it takes to get there. By considering these questions at a high level it prevents the discussion from degrading into minutia, such as specific tools or platforms, which I think hurts the conversation. I am sure I have overlooked many important things, but again the purpose was not to be speific. As always, I welcome any and all comments.